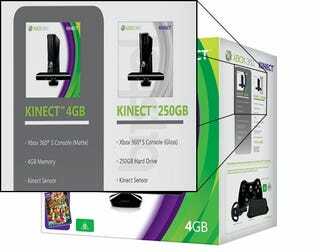 Microsoft's controller-free Kinect platform is getting a 4GB bundle that comes with an Xbox 360, 4GB of memory, a Kinect sensor, a game and a controller. That doesn't look like the only bundle. The Australian packaging for the 4GB bundle shows what appears to be a 250GB bundle that comes with a 250GB hard drive and a headset. The console in the 4GB bundle has a matte finish, while the console for the 250GB bundle has a glossy finish. The packaging for the 250GB also notes this, "Hard Drive includes game and demos." Kotaku is following up with Microsoft.